Home sellers are streaming into the Tallahassee real estate market at a much faster rate today than they were in the past few years. Perhaps it is a belief that more buyers are now in the market (there are), or perhaps it is an understanding that home values have risen and have created equity for many previously trapped homeowners (who owed more on their home that it was worth). Regardless of the reason, we can definitely see the sizable increase in the number of homes listed for sale. This report takes a look at a growing trend in these new offerings on the market. I have completed an exhaustive study of the properties that have been listed for sale in Tallahassee over the past few years (since 9/1/2012 to be specific). 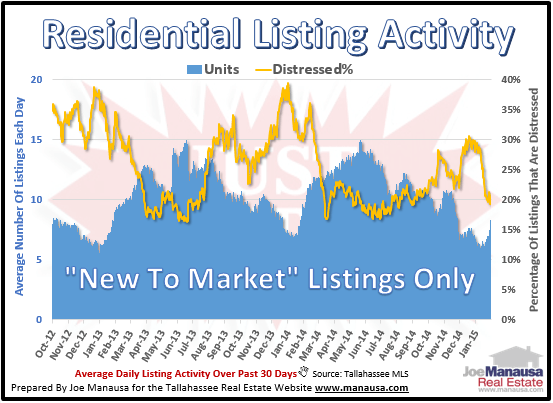 The Tallahassee MLS is a wonderful tool for initiating the marketing of a property, but it is horrific when it comes to using the data to track trends in the housing market. Unfortunately, it was established purely as a marketing tool, thus pulling data directly from the MLS does not produce accurate housing reports. Many of the listings are duplicate entries of previously listed homes, so if we really want to know what is "fresh" on the market, quite a bit of diligence is required to extract this information. Fortunately, this is something I really wanted to understand, so I now have the information and can share it with our readers. The real estate graph above shows the number of listings taken each month, by price range. Unlike reports generated directly from the Tallahassee MLS, this report shows only the initial listing for each property. For the purpose of explaining why exhaustive work is required to evaluate the flow of listings coming into the market, I have selected an example of a home that has recently returned to the market. The property (323 Buttonwood Lane Tallahassee, FL 32317) was chosen merely because it was recently "relisted" and has been attempting to sell for more than 5 years. So imagine if you were running a report to show you new listings in the Tallahassee MLS. This property would show up 4 times "for sale," and once "for rent." You would think there are four times the number of homes for sale, and all the activity since 2009 is really fictitious, right? So our graph has removed the duplications, and at least one alarming trend is obvious right away. If you saw our report on luxury homes in Tallahassee in yesterday's blog post, then you know that the highest end of the Tallahassee real estate market is doing quite well. But take a look at the growing trend of homes priced above $500,000 entering the market. The number appears to have more than doubled in just the past two years. Do you think the number of buyers who can afford a home over $500,000 has doubled? Tripled? What will happen to the number of buyers in this price range when interest rates return to normal (which would be more than double today's current mortgage interest rates)? We will be examining this and more in our continuing attempts to provide a better understanding of the supply and demand for homes in Tallahassee. If you have a specific question about your home or a move that you would like to make, simply drop me a note and we'll reach out to you right away.